Welcome to the third episode in the Self-reflection series! In last week's episode we looked at a great tool to give all those thoughts, ideas and ambitions and outlet. This oh so simple rule changed how I saw my ever mounting list of dreams and gave me the tools to start putting my life in order and achieving some of those originally unreachable goals. If you'd like to find out more and put your life on the right tracks why not have a go too - just follow this link! Today we're going to be taking the next step and breaking our ambitions into smaller achievable chunks. I think one of the hardest things to overcome when you have a lot of conflicting or diverse dreams is wanting to do them all now! I feel like that on a regular basis and no doubt I'm sure you might be able to relate too. But by expressing those dreams in a visual form you allow yourself to really, literally 'see' them. Maybe you'll notice connections, by doing one you'll make steps towards another, or identify a logical order in which you might pursue your dreams. If we tried to commit to all our dreams everyday we could easily find ourselves only able to commit 20/30minutes to anyone task - that makes for slow progress. Or worse you might find yourself failing to hit your targets because there was just too much to do in one day. That can be really demotivating, and something we want to avoid. But by laying them out we can getter a better feel for a more logical and paced order to do things. It's OK if from one day to the next your motivation changes direction from one dream to another, embrace it when you've got it, but just try to make sure that whatever you're aiming for you're not trying to do everything at once! So - This week we are going to be making Bucket lists. Now I hear what your saying, well this isn't new?! I know, but it's a great tool and at the end we're going to be including one very important list people so often forget. We're going to start with the BIG list. What are your ultimate dreams and ambitions? What would be the ultimate experience or "I've made it moment?" Does it seem unrealistic? They're all very different dreams. Certainly not going to happen over night right? Well yes you're right! In fact to me these all seem so big why would one person want them all? Well if you're like me and passionate about just about everything, you're list is probably just as lofty! "But surely she knows she'll never do them all?" I hear to say. Well you might be right, but if you too have multiple dreams and start 'refusing to choose' you will soon realise that actually a lot of it's in the journey. Having something to aim for is exciting, and of course you hope to get there but so much of the reward will be in the process. Still, looking at the big list can feel a overwhelming, just trying to tackle one now would seem like too much to handle, but that's where the LITTLE list comes in. 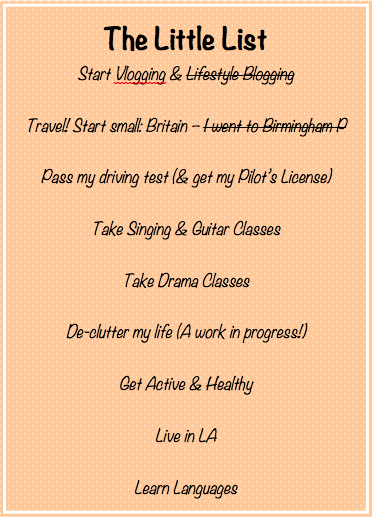 This definitely isn't my whole LITTLE list but hopefully it gives you an idea of more tangible targets to aim for. Everyone one of these targets brings me a step closer to something on the BIG list. Well...almost all of them, some are definitely things I want just because (Pilot's License - don't ask me why I honestly couldn't tell you!). The great thing about the little list is you can keep breaking it down. I actually normally have several little lists on the go at any one time, which break down into even smaller chunks. So for example, Travel! I was so nervous to start travelling for fun (you can find out more about that here...) so I've been starting small and took my first trip just a short few weeks ago, to a very fancy hotel only a few hours train ride from where I live. That was one one of the points on my LITTLE break down list! So I haven't seen the whole of Britain, but I've started the journey and I can keep adding to that without feeling like it's unachievable. To give you one more quick example let's look at taking drama classes. Now truth be told I've never taken a drama class in my life, in fact for most of my childhood I had no interest in it. I was shy and awkward and scared of confident people and jumping into the thespian pool was not an option for me. But as I've matured, I've found more confidence in myself, and one day I would love to be in a movie. So lessons is a must, but I also have this thing that I like to know a bit about something before I just dive in and make a fool of myself. So although I've not taken classes yet, I've bought books and DVDs and I've been studying in my own time, so those again have been ticked of my LITTLE list break down. It's all about the small steps. As you can see I've already started ticking things off my LITTLE list which is perfect because that leads me straight into our final forgotten list - the OTHER list! I can't emphasise the importance of this list enough but to keep your confidence and your motivation up and the belief you can succeed strong, you NEED this so often forgotten list. You see, so many people don't get a chance at their dreams, not because they can't do it but because they don't feel they can succeed. I'm a terrible one for thinking "well yes I did it but I didn't get the grade I wanted", or "I could have tried harder but I didn't...what's the point now?" The important thing to remember is that you can beat yourself up over things you wish you'd done better but only you will suffer and if you can look back on your past with kind eyes your chances of success in the future are so much greater! So for your OTHER list, I want you to think of all the things you have succeeded with in your life. It doesn't have to be big, and you don't need to have got the best grade in your class, or maybe even what you hoped you would. But make the effort to look back and think "OK but I did it though!" You'll be amazed just how many things you've already completed (or started!). 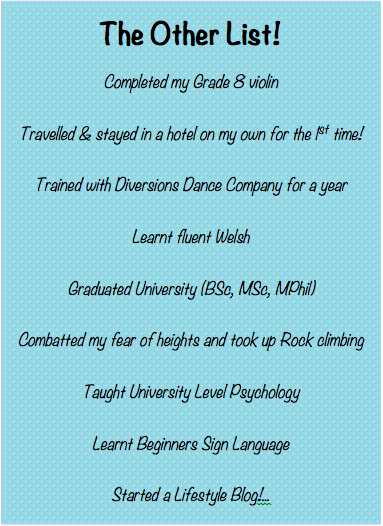 Whether you've had children, you've passed an exam, you've overcome a fear, you've gone on a diet, you've learnt something new, you've done...anything, literally anything! Write it down and be proud, and every time you take something off the list, BIG or LITTLE, add it on and keep it somewhere you can look back at when you're feeling less than confident. 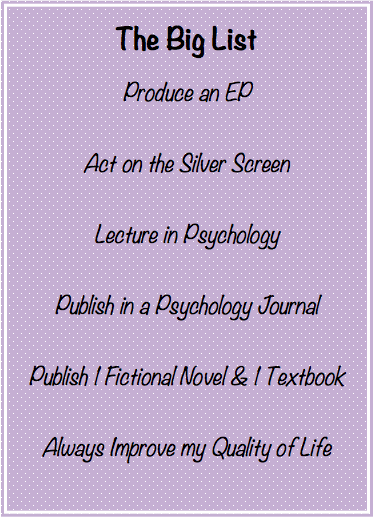 You can see from my list, it doesn't have to be a competition you won, or a qualification, it can be a personal achievement too, and each is as important as the other. I can also assure you that some of the things on my list have actually been real negatives in the past. I didn't get the grades I wanted, or the outcome I hoped for every time, but you know what, I still did it. I tried, and I'm proud of that, so I've turned it into a positive and it's on my list! You'll see too that points from my little list have already started making their way onto my OTHER list, and the feeling is great. Take some time today to write your BIG, LITTLE or OTHER list and let me know in the comments below something you hope to tick of the list this year. Sunday Self Reflections: Life Spring cleaning! 25 days later...the Instagram happy challenge!